…we will not care about what we do not recognize. 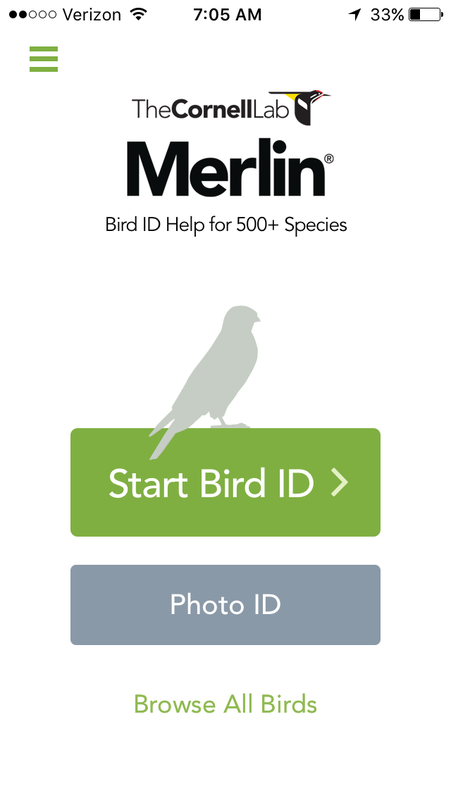 The Cornell Lab of Ornithology launched its popular Merlin App in 2014. It is billed as an online field guide assistant for beginning and intermediate birders. 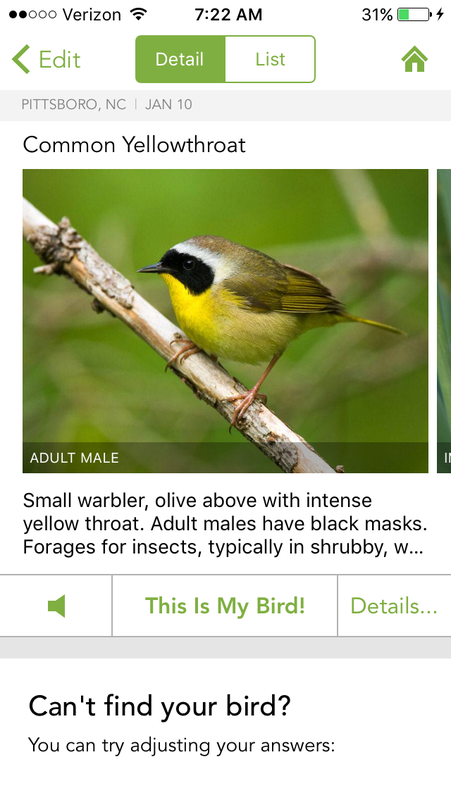 The app asks you a series of questions about the bird you just saw (such as the color, size, and behavior), much like an experienced birder would if they were trying to help you identify it. To be honest, I never downloaded that app, figuring I had enough experience to use field guides and figure most birds out on my own. 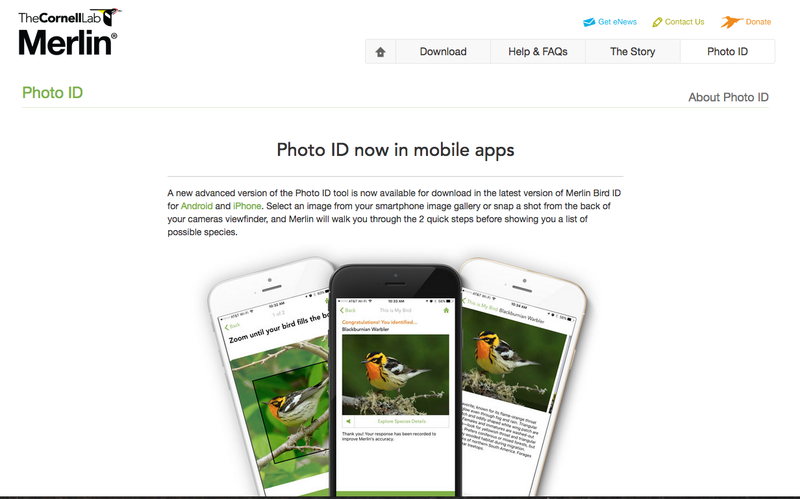 But, late last year, a new feature was added – the Photo ID portion of the app. I heard about it from a couple of people I know, saw a review online by a fantastic wildlife photographer I follow, and then had a friend post about it on her blog. I decided to check it out and downloaded the free app to my iPhone (also available for Android devices; being developed for laptops and other non-mobile devices).. Details on how it has been developed are mentioned in a press release about the launch of the Photo ID portion of the app last month. 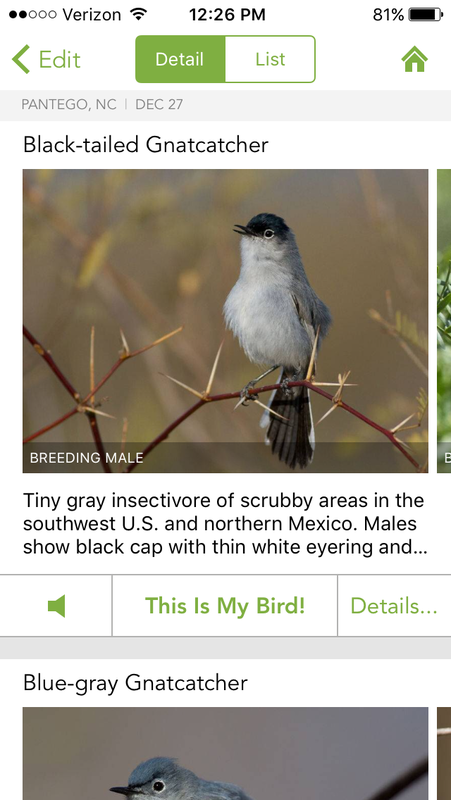 The app claims to have about a 90% accuracy rate in identifying over 600 species of North American birds. I decided to give it a test drive and see for myself. The app has a simple and elegant design. You simply click the Photo ID tab and either take a photo or choose a photo from your files. 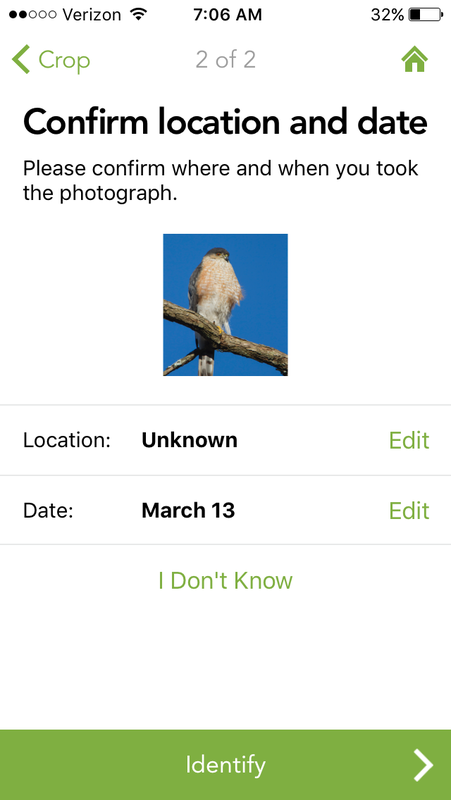 The app pulls information off your photo as to date and location. I had to fill in the location information since this was a photo I uploaded from a file on my computer, not one directly from my camera. Once I had added Pittsboro as the location, the app can compare my image to its database of images (I think it has at least 1000 images of each species covered) and then gives you an identification. Boom! It got it right. It even gives alternative possibilities if you scroll down in the app. This can be very important for some species where confusion is likely (like this one), or if the photo you use is not that great. I soon realized I didn’t need to transfer images from my laptop to my phone for identification, I could simply click the Take Photo tab and take a picture of my laptop screen with my phone and use that image. So, here is another. 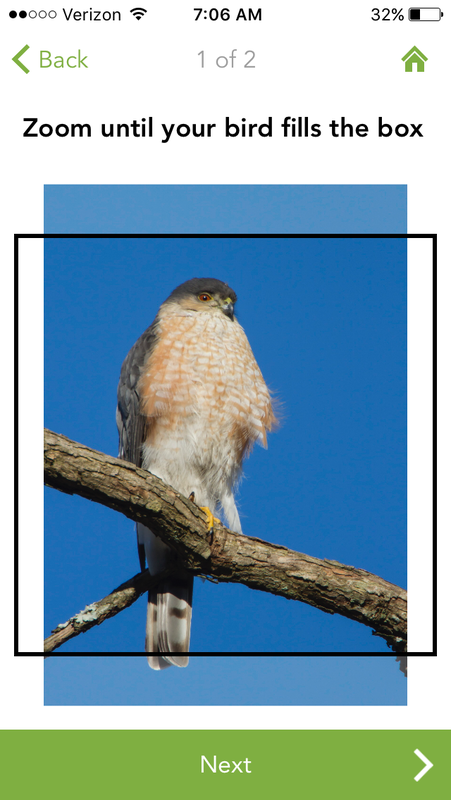 For these next few images, try to identify the species before you see the Merlin App identification. As this progresses, I intentionally use pictures of lesser quality, those that I normally would delete from my files, to see how the app performs. This first one is a photo of a pretty nondescript species (taken with my phone of a fairly good shot on file on my laptop, note some of the squiggly computer screen lines in the photo). Indeed, it is a female of a warbler, the common yellowthroat. 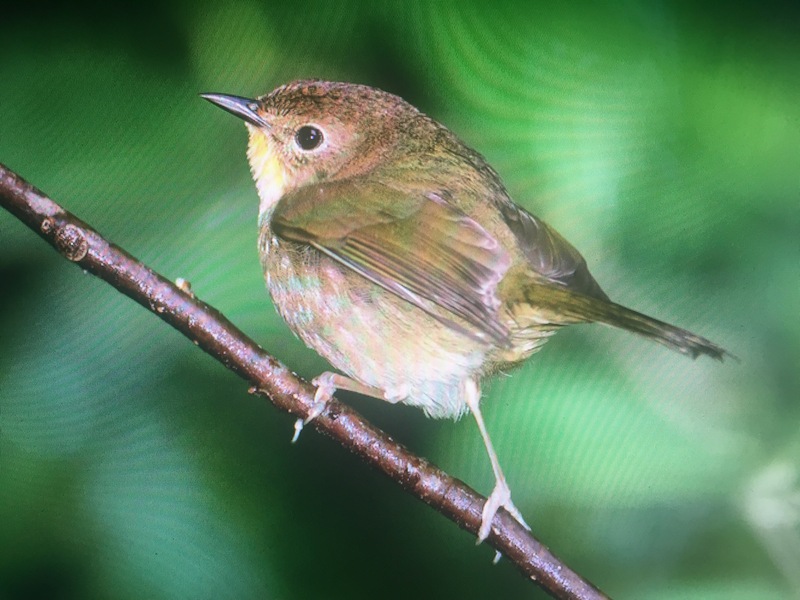 The app gives you multiple images of each species so I swiped through and found an image of a female (turns out my image is better than the one they have on file). In all fairness, I knew what that bird was. If I hadn’t, it might have been tough for me to figure out based on the images the app provided. But, the beauty of this is it gives you a place to start in terms of looking up your bird in a field guide (book or online). Here’s another, a bird I photographed with my iPhone as it was getting dark in the Boundary Waters last October. 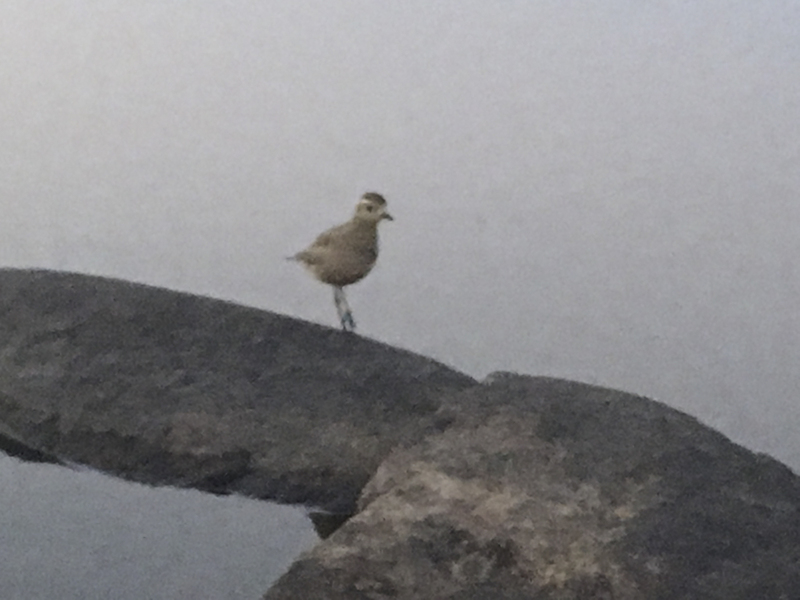 This bird landed next to us on a boulder and walked around, allowing me to get a good look, and this crummy photo. I did not know what species this was, as I had never seen this one before. Once we got back home, I identified it using my field guides, but the app got it on the first try. An American golden plover, a new species for me. 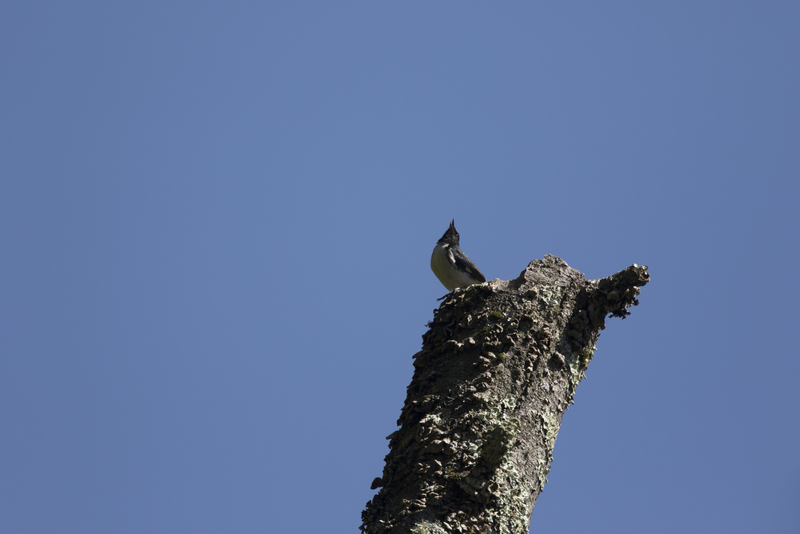 Once again, I had to swipe through the images to find the shot of the bird I saw in its non-breeding plumage. Merlin gave me the wrong answer the first time, calling this a fish crow. I zoomed in even more, tight on the bill, which is diagnostic of this species, and it got it right (did you?). 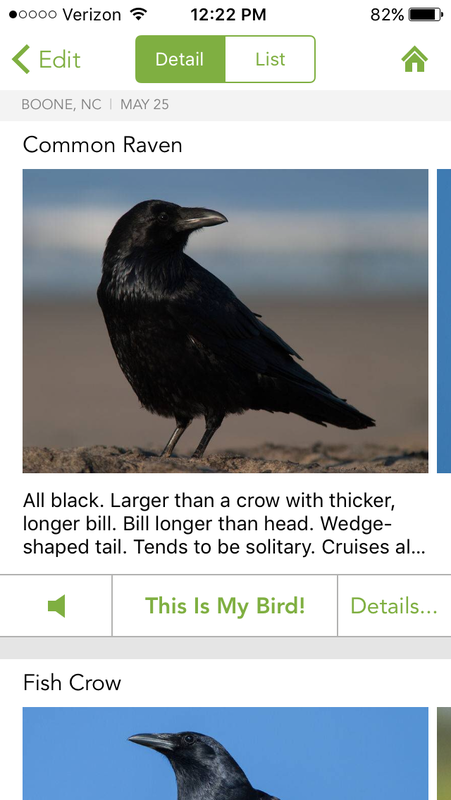 Notice that fish crow is the second option this time (other options are listed below the primary choice in the app). I found that zooming in and out did make a difference on some species. The first time I tried the next photo, I was in very tight on the whole bird and it gave me red-headed woodpecker as the answer. Zoom in on the photo and see if you can identify it. I edited my photo on my next try by backing off a little and, this time, Merlin was right. It is a male black-throated blue throwing its head back in song. I tried a range of images of a variety of species differing in photo quality. They were all images where I knew the identification of the bird from other, better images, taken at that same time. Merlin did not get a black-capped petrel or the glaucous gull from the pelagic birding trip I took last winter. Turns out that species of petrel is not one in the database as yet, and the gull was misidentified as an Iceland gull. And, it surprisingly gave me a related species (correct species as second choice) on the following really terrible image I used from the Christmas bird count this year. 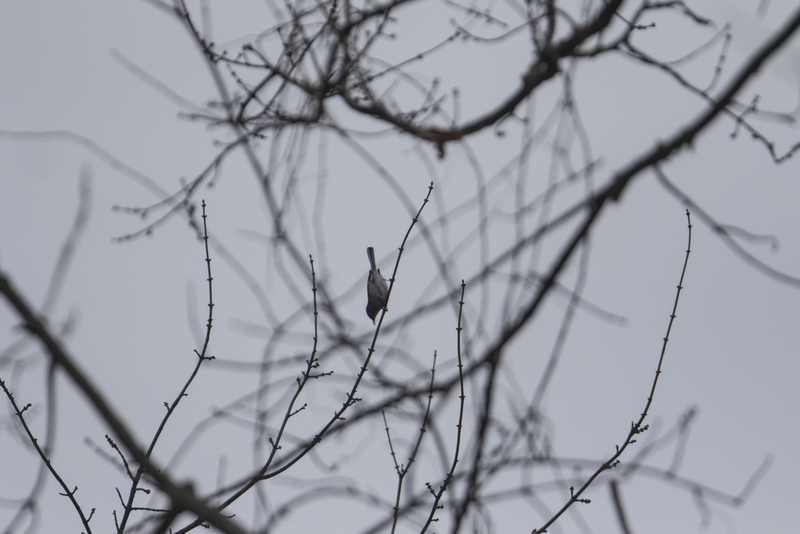 Yes, a blue-gray gnatcatcher, a species not often seen in winter in these parts (but also not an extreme rarity). Interesting that it gave me a species from the southwestern United States even though I put in the location information for our count. But, to get any gnatcatcher from that photo is pretty impressive if you ask me. The photo does not show the flitting behavior, nor the relatively small size I witnessed while watching the bird in person. 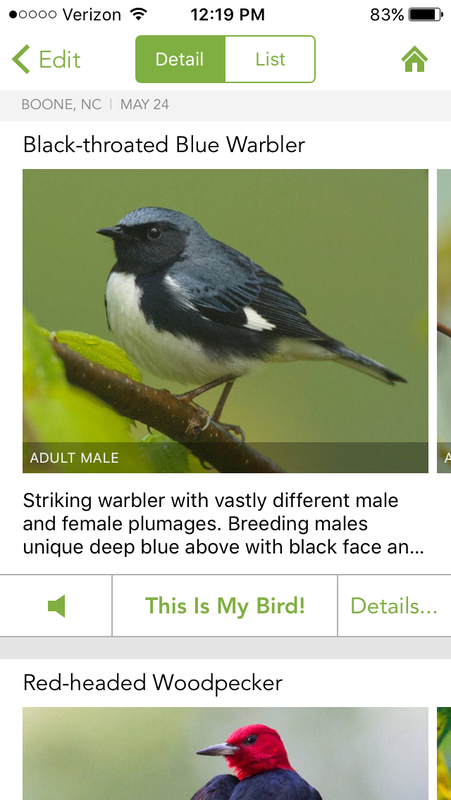 Overall, I think this app is a great tool for anyone that wants to identify the birds they photograph. 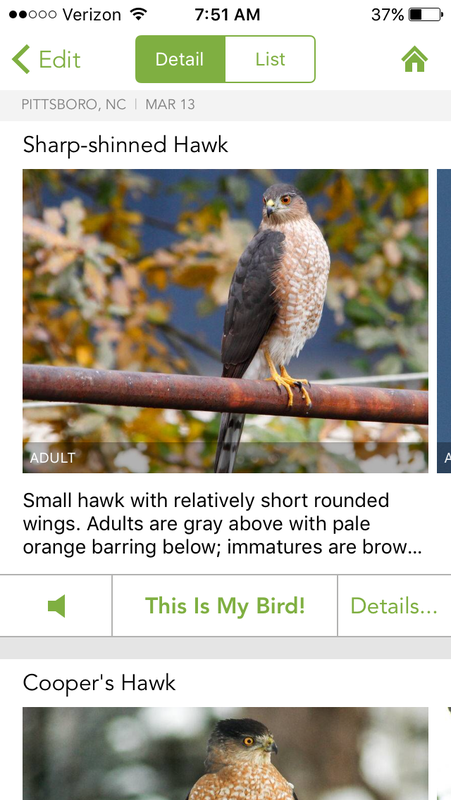 I get asked a lot of questions about bird identification (which I enjoy tying to answer, by the way), but I will also be recommending this app for all those folks from now on. Give it a try, download Merlin and have some fun. 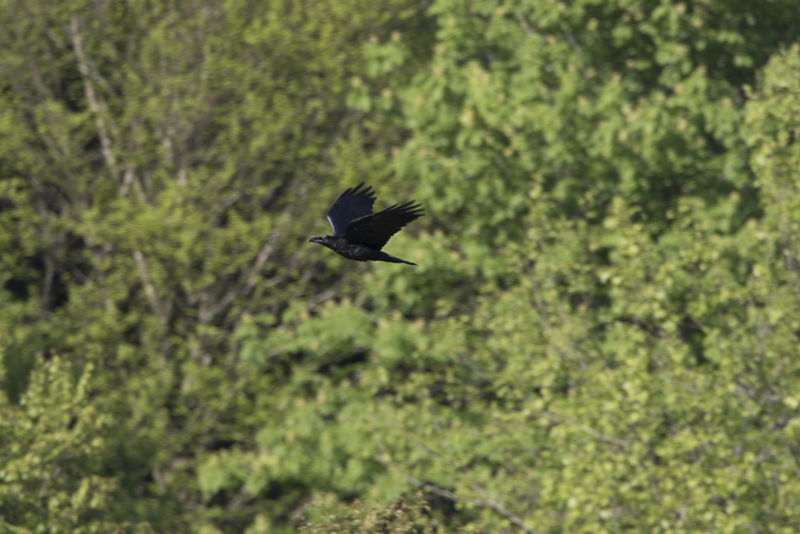 While you are at it, I recommend making a donation to the Cornell Lab of Ornithology to help them continue to produce valuable information for all us folks trying to learn about, and conserve, the birds around us ( I just did). This entry was posted in Nature Photography, Uncategorized and tagged bird identification, merlin app by roadsendnaturalist. Bookmark the permalink. Mike, I agree that Merlin works best for species with more data (every time you use it, if you click “This is my bird”, you contribute your photo to the database), and that the tightness of the cropping makes a difference. In fact, in your first example, I was surprised that it worked so well even though you didn’t position each edge exactly at the edge of the bird in the image. It really is amazing what they have done. I now use it on photos I see on the Carolina Birders FB page where people are asking for help identifying them. So far, it is 100% accurate even with some pretty poor images. Agreed. You, and the people you know, might just be the ones to do it! Thanks, Mike! Birds are not especially my thing, but I do watch some and frequently “wonder” what something is — especially the ones that don’t often show up. My mother would have love this — one of the few things I regret she didn’t get to have.